Dallas Cowboys tailback Tony Dorsett was the premier rusher in the NFL during his decade long career, rushing for 1,000 yards or more in eight of his 12 NFL seasons. Dorsett began his professional career in 1977 after a historic four seasons with the Pittsburgh Panthers capped off by his Heisman Trophy winning campaign of 1976. The Aliquippa, PA native finished his NFL career with 12,739 rushing yards and 77 rushing touchdowns. Dorsett was inducted into the Pro Football Hall of Fame and College Football Hall of Fame in 1994. 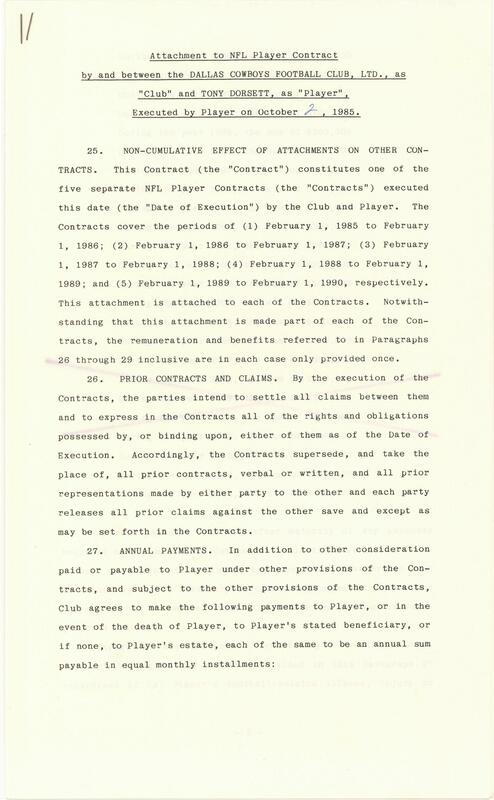 Offered here is Dorsett’s NFL player contract for the 1986 NFL season. Dorsett and Herschel Walker formed a dangerous two-headed backfield in 1986, with Dorsett rushing for 748 yards and Walker for 737. This contract is for the value of $450,000 between Dorsett and the Cowboys. 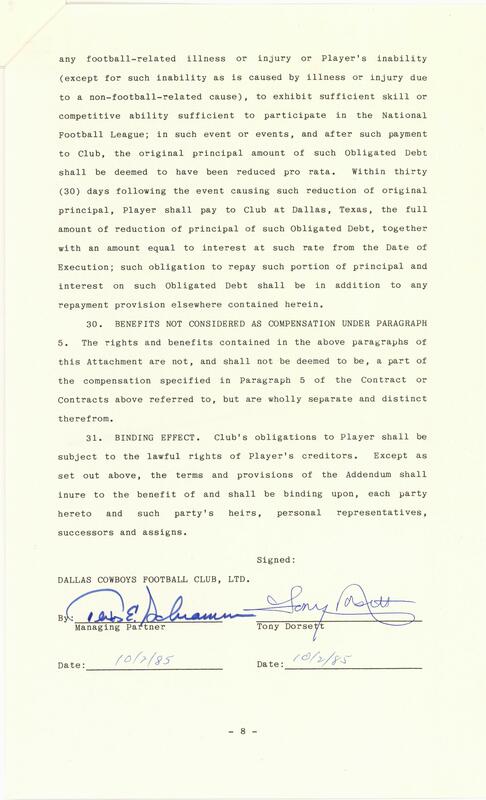 The first part of this contract is printed on pink paper, and it has been signed by both Dorsett and Tex Schramm. Additionally, it has been initialed twice by each man. Dorsett has signed in blue pen, while Schramm has signed the contract in blue marker. Also included with this contract is an eight-page attachment signed by both Dorsett and Schramm. Again, Dorsett has signed his name in blue pen and Schramm in blue marker. 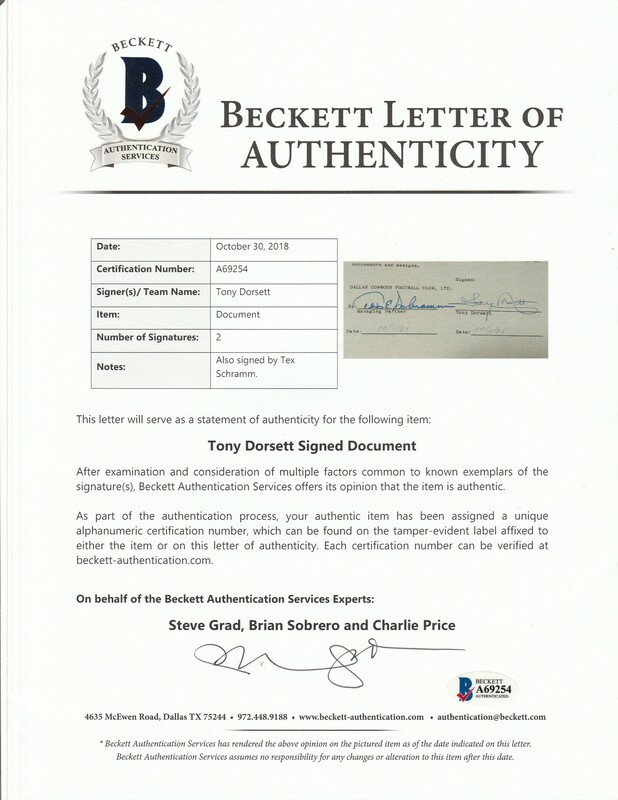 This lot comes with a LOA from Steve Grad of Beckett Authentication.